Everyone wants privacy in there home and there are many different procedures one of which is having some form of gate installed to stop unwanted access to your home. Working throughout areas such as Bath, we install and maintain automated gates and barriers for clients to help keep un-authorised access to a minimum as well as keeping people off site. For this project we were performing our routine automated gate maintenance service for a client living in the Bath area. Our service ensures your automated gate is working all year round and provides you with the utmost level of security possible. For more information about our gate services get in touch today. 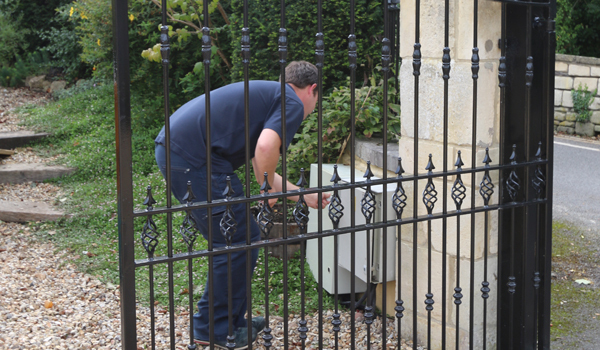 We offer an expert automated gate install and maintenance service for clients in Bath and the surrounding areas. Want to know more information about the type of automated gates that we install get in touch with our Bath based team. Our automated gates are tailored to your exact style and needs to ensure that your premises is protected at all times giving you complete peace of mind. For further peace of mind. we are NSI Gold approved installers which means all of our automated gates are installed to the highest of British Standards meaning they are unlikely to fail or break on you. Want to know more information about our services get in touch with our Bath based team today.